This hummus is a creamy-dreamy dip version of the popular Ginger Dressing at Japanese Steakhouses! 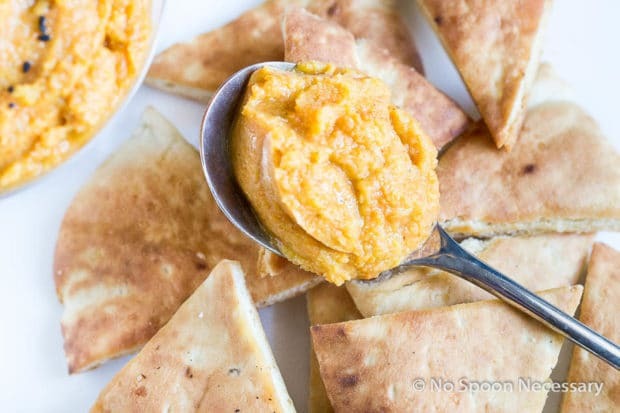 Savory, sweet, umami and packed with flavor this dip is healthy and dazzlingly delicious! Where do you find inspiration to fuel your passion? Pictures, people, nature, the internet, everyday life, or maybe within yourself? I seek inspiration for my culinary adventures, which is my passion, in everything. It always seems to be lurking around a corner, like an oyster just waiting to reveal a precious pearl. The humble potatoes at the grocery store, for example. One day I may lovingly toss them into the cart, or simply walk on by. The next, they might spark creativity within me, to make this or this. Point being, I am always searching for culinary inspiration. 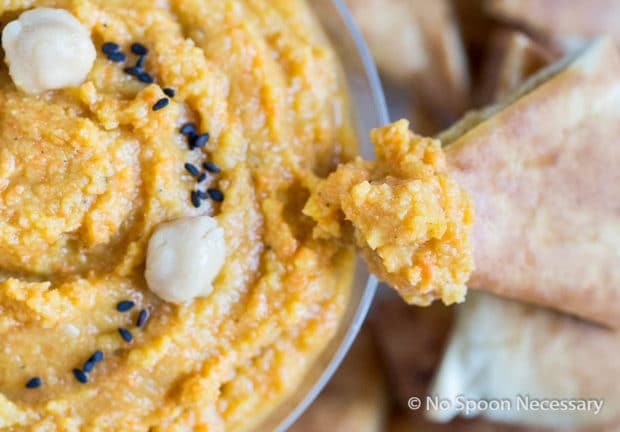 The inspiration for this Japanese Ginger Dressing inspired Hummus came from a food truck. One of Boy and I’s neighbors has a food truck Christmas party every year (genius idea, right?). This past Christmas, I was feeling ill and could not attend her holiday gathering. However, Boy was lovely enough to go over and bring me back a little something-something to nibble. What he brought back for me blew my mind (and my taste buds). It was ‘Japanese’ Hummus. This dip tasted exactly like ginger-carrot dressing married hummus and produced this ‘Japanese’ Hummus as their first born. From first bite, I knew I had to recreate and share this. Immediately. I am excited to declare, as I do a little happy dance, I did exactly that. 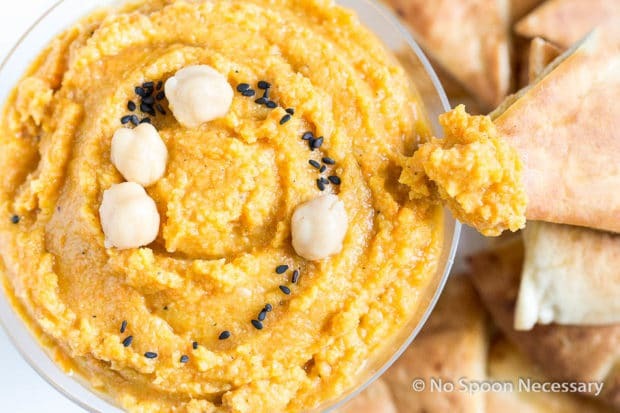 If you like Japanese ginger-carrot dressing, you are going to seriously fall head over heels in culinary love with this hummus. 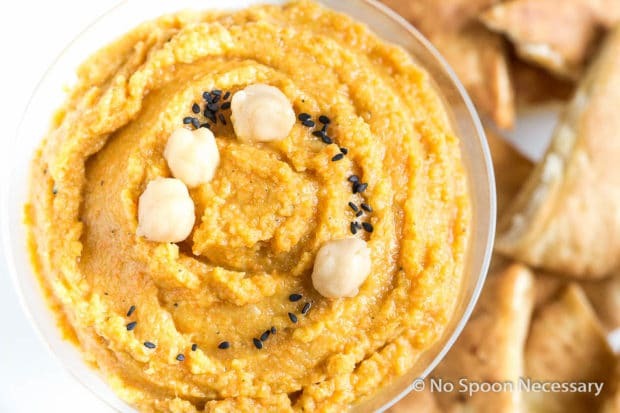 This Japanese Ginger Dressing inspired Hummus hits all the right notes. It is creamy, rich and luscious in texture; savory, slightly sweet and umami in flavor. Overall, it is dazzlingly delicious. This hummus is my new favorite go-to condiment. To say I am slightly obsessed would be an understatement. It is scrumptious on salads, great as a dip for crudité, delectable slathered on some toasted pita bread and yummy as a replacement for mayonnaise on sandwiches. Shoot, it’s just freakin’ good on its own… big, heaping spoonful right into your mouth. 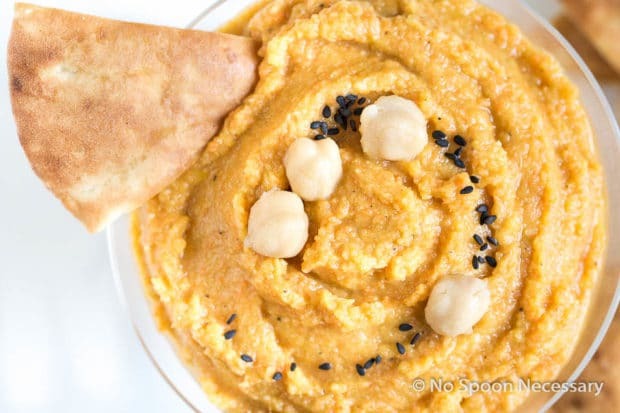 I did happen to create something spectacular with this hummus, and it is coming up next on the blog. But, due to my sneaky ways, you will have to come back for that dish (insert evil grin here). 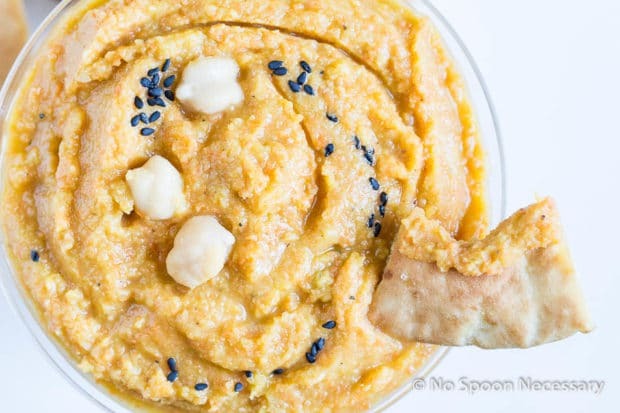 So until then, take 10 minutes and whip up this Ginger Dressing inspired Hummus. I promise you are going to love it. In the bowl of a food processor, pulse the ginger, carrots, onion and garlic until finely chopped, about 10 pulses. Add in the garbanzo beans and pulse again, until everything is minced, about 10 more pulses. Add in the rice wine vinegar, sesame oil, soy sauce, tahini, sugar, salt and pepper. Process until combined and has an almost smooth consistency, about 1 minute, stopping to scrape down the sides of bowl if necessary. With the food processor running, slowly add in the olive oil (through the opening at the top of processor) and process until desired consistency is achieved. Taste and adjust for seasoning. Transfer to a container, cover, and refrigerate for at least 1 hour to allow the flavors to develop. Serve with raw veggies, pita chips, or use as a salad dressing. 2. Cut pita bread into 6-8 wedges and arrange on a baking sheet. 3. In a small bowl mix extra virgin olive oil with a few dashes of garlic powder, salt and pepper. Use a pastry brush to apply olive oil mixture to both sides of pita bread. 4. Bake for 12-15 minutes, rotating pan and filling pita chips over, halfway through cooking time. Tsssssk, how dare you making me wait for another recipe! I’ll just indulge in your gorgeous pictures until then. 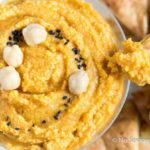 I love hummus and I’m always looking for new flavors to create! lol, we are on the same page, i just put up a hummus recipe too! also, this sounds delicious, i’m going to have to make it soon, and a christmas food truck party is my kind of party!! Looks good, I love hummus! !